This rose is a slight oddity, it doesn’t fit into the ‘normal’ brackets of our garden roses that we like to add them too, it even doesn’t quite fit into wild shrub rose bracket I like to add the more species based roses into. But that doesn’t make it a bad rose, it just means we humans can’t add it into a ‘bracket’ like we do to understand things. So why is it so difficult to label? Well it’s a cross between rosa pimpinellifolia and an autumn damask rose that happened by accident in a garden in stanwell, Middlesex. It was introduced a few years later by Lee of Hammersmith in 1838. The rose pimpinellifolia is a suckering wild shrub that can be found around Europe including the UK, it tends to flavour a poorish soil and will take over sand dunes quite happily. It does make a shrub up to 5ft tall if allowed but it does make a pretty lax plant that needs the support of the older branches, the thorns are pretty fine and very numerous on the shrub but that adds to its charm added to the greyish green fine foliage that makes a brilliant drop back for the lovely pale pink quartered flowers that have the most delightful scent, that are indeed are borne all summer long and well into the autumn months followed by some large black hips. 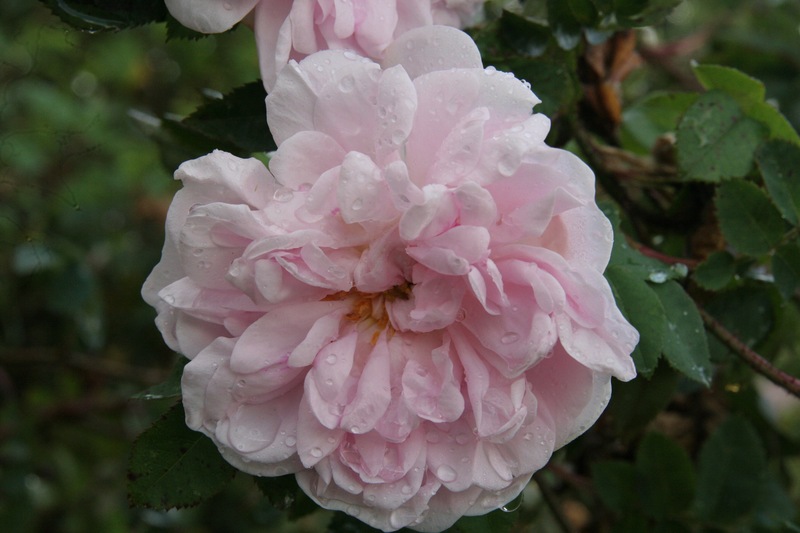 It is a beautiful rose, one that is at home in a border and also at home in the more wild parts of the garden and was indeed Gertrude Jekylls favourite rose to plant into this type of area. Normally such heavenly quartered flowers aren’t good for bees but this one is the exception and will attract bees in quite happily. It is also an exceptionally tough rose, it will take all soil conditions apart from heavy clay and will also take a shady spot in the garden. In her book of roses, Gertrude Jekyll, recommends planting them 1ft apart to form a self supporting group, from my experience, I would agree with her and found it does make a better specimen if treated like that, otherwise it makes a pretty arching shrub. Can be trained into a informal hedge as well. Pruning is dead easy, almost as easy as rambling roses! Any long growths reduced by 2/3rds and remove expired wood and that’s it! Pretty disease free as well. A great rose to start with! Can be brought from most nurseries and garden centres as well as being seen in most good gardens.